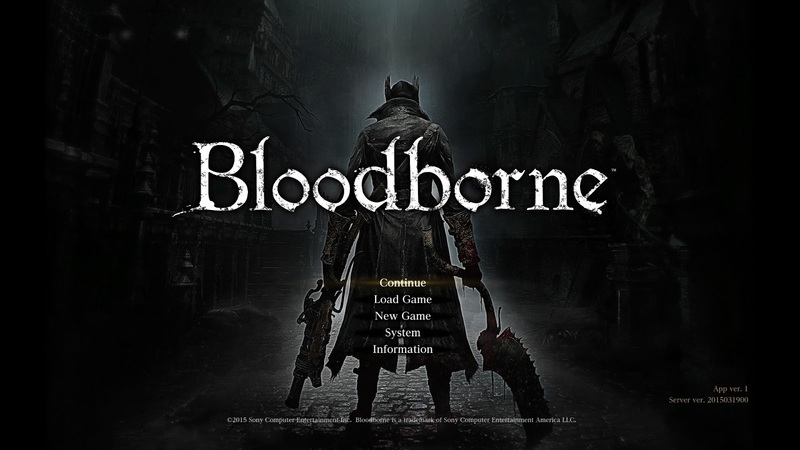 Press any button on the title screen to open the Title Menu. The following options appear. Continue: (*requires save data) Resume play using the most recent save data. Load Game: (*requires save data) Resume play with selected save data. Log In: While offline, select this to test connection and use network features. Information: When online, view announcements here. 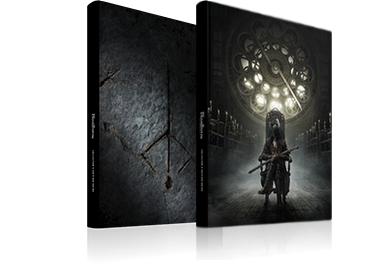 Saving: Bloodborne uses an auto-save feature that automatically saves progress at set intervals. While saving, an auto-save icon appears in the upper right corner of the screen. Auto-saving overwrites previous data. The main game screen is composed of the following elements. An auto-save icon appears in the upper right corner of the screen while saving. 1. HP Gauge: Indicates your character's HP. Depleted by enemy attacks. Loss of HP results in death. Restore HP by using Blood Vials or rallying. 2. Stamina Gauge: Indicates your character's stamina. Depleted by player actions such as attacking, dashing, and quickstepping. While stamina is fully depleted, these actions cannot be executed. Stamina automatically replenishes over time. 3. Blood Vials: Indicates remaining Blood Vials. Press Triangle to use one. If number is blue it means you have reached maximum Blood Vials you can hold [pic]. 4. Quicksilver Bullets: Indicates remaining Quicksilver Bullets. Required to fire guns and use certain items. If number is blue it means you have reached maximum Quicksilver Bullets you can hold [pic]. When Blood Bullets are crafted, remaining Blood Bullets are indicated just below remaining Quicksilver Bullets. 5. Equipped Items: Items selected as Quick Items are shown here. Press Square to use the indicated item or Down to switch items. 6. 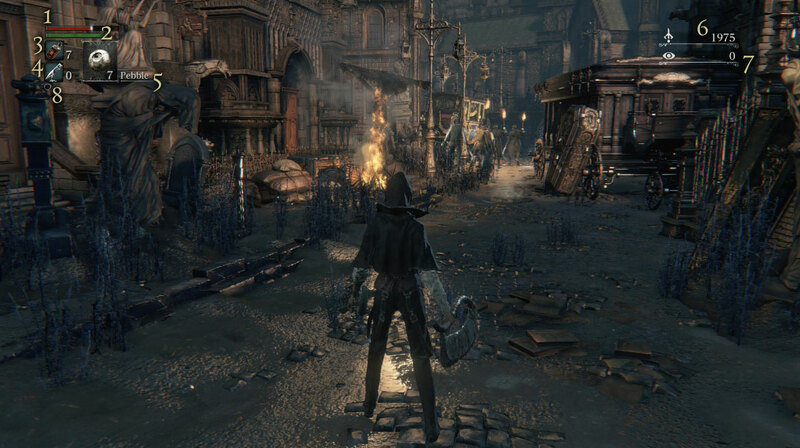 Blood Echoes: Indicates total Blood Echoes. 7. Insight: Indicates level of Insight. 8. Right-hand Weapon Status: Indicates the status of the right-hand weapon. When wielding a trick weapon, pressing L1 transforms the weapon, a state indicated with yellow. Resistance Gauge: Appears when your character receives status-altering damage. Status-altering damage fills the Resistance Gauge. Once full, your character's status becomes afflicted. When the gauge is depleted, status returns to normal. Your character can be affected by the following status afflictions. Slow poisoning: Slowly erodes HP. Rapid poisoning: Rapidly erodes HP. Frenzy: Causes massive damage to HP. Beasthood: A longer gauge strengthens attacks but also reduces defense. Press OPTIONS to display the icons of the System Menu. Select an icon with the directional buttons, and then press X to open the corresponding menu. Inventory: View or use items currently held. View the items you are currently carrying. To use or discard consumable items, press the up and down buttons to browse through items, and then press X to select an item. Stats: View your character's stats. View your character's stats. The left side of the screen displays your character's level and attributes, such as vitality, while the middle displays HP, attack values (ATK), and status affliction resistance values, and the right side displays Caryll rune effects and damage reduction values. Settings: Configure various game settings. Configure control settings, music volume and other sound settings, the brightness setting, and network settings. Select EXIT GAME to save your current progress and return to the title menu. Arms: Equip weapon. First, press X to select a slot. Next, press UP or DOWN to select the desired weapon, and then press X to equip it. To remove a weapon that has already been equipped, select it and press X again. You may be unable to equip a weapon if your character does not have the attributes required to wield it. Attire: Equip pieces of attire. Equip attire. This is done in much the same way as weapons. Quick Items: Set quick items. Set quick items. 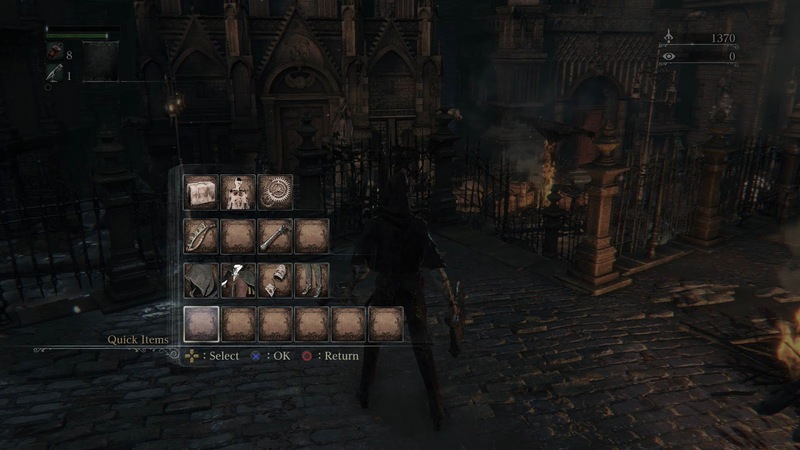 Once set, these items can be used in the field by pressing SQUARE. Select a quick item slot by pressing LEFT or RIGHT, and then use UP or DOWN to select an item and X to set it. To remove an item that has already been set, select it and then press X again. Most of the menus are easy to understand, but none are more important than the weapon menu, and none are quite as hard to fully grasp Pressing SQUARE on one of the weapons in your weapon list or when looking at weapons in the shop, will bring up the detailed weapon info menu, which we'll take a close look at here. 1. Damage Types: These are the different types of damage a weapon can inflict. Enemies have separate defense values against each of these types, so it's important to know which type your weapon uses. For much more on this, see the Damage Calculation page. 2. Attribute Bonuses: Attribute Bonuses are also known as Scaling. They show how well a weapon scales with one of your damage-increasing stats: Strength, Skill, Arcane and Bloodtinge. The scaling is rated by letters: E, D, C, B, A and S - so a weapon with C for Strength won't gain much attack power as you raise your Strength stat, but if it also has S for Skill it will gain much more if you raise your Skill stat instead. 3. Special Attacks: The numbers shown here detail your weapon's ability to deal out status ailments and racial damage bonuses. The first two will remain at 0 unless your weapon is Chikage, with it's built-in Rapid Poison, or has a Blood Gem equipped that allows it to inflict Slow Poison or Rapid Poison. The next two values show if the weapon can deal more or less than the default 100% damage against either Beast or Kin enemies. 4. Attribute Requirements: These values show the minimum amount of a given stat, either Strength, Skill, Bloodtinge, Arcane, or a mix of these, that is required in order to wield the weapon. 5. Blood Gem Slots: These three boxes at the top are where you'll see any Blood Gem you have fortified the weapon with. 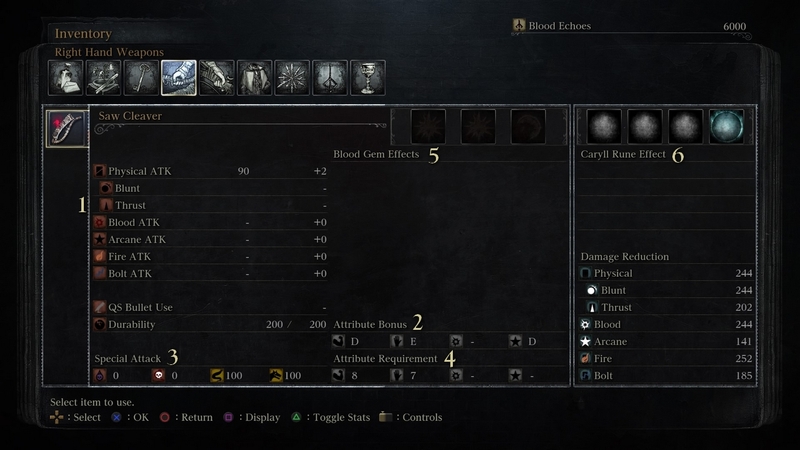 The Blood Gem Effects are listed below these, and there can be up to a maximum of three effects per Gem. 6. Caryll Rune Slots: The four slots in the top right are for equipping Caryll Runes. There are three normal slots and one Oath Rune slot. The space below the slots details the effects of your equipped Runes. You'll need the Rune Workshop Tool in order to equip Runes. Pressing the right side of the touchpad brings up your Personal Effects menu. This gives you another six slots to access items from, much like the Quick Items. They are not quite as quick to use, though, because you must press the touchpad and then X to use them. This means they are best used for non-urgent items, such as the Beckoning Bell and Notebook, or for items you'll use often but don't want to take up a Quick Item slot with, such as the Monocular or Hand Lantern.